The Food Alphabet and More: The Jollibee Choco Mallow Pie is back and better than ever! The Jollibee Choco Mallow Pie is back and better than ever! Fans of a certain luscious, chocolatey, and crispy Jollibee dessert pie can finally rejoice—the much awaited return of Jollibee’s Choco Mallow Pie is finally here. The original Choco Mallow Pie is a sweet treat that many sweet-toothed Filipinos cannot easily forget, with its creamy marshmallow and rich chocolate filling inside flaky pie crust. This 2017, the new and improved Choco Mallow Pie is chocolatier inside and out. 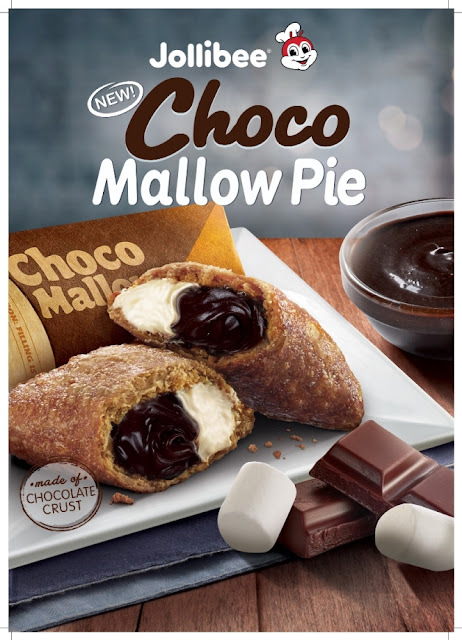 The mouthwatering combination of imported marshmallow and a mixture of dark and milk chocolate that delivers an explosion of flavors with every bite, complemented by a crispy chocolate-colored crust. This hits the right spot for chocoholics! Catch the highly anticipated return of the Jollibee Choco Mallow Pie this May 8, 2017 for Metro Manila and Luzon, and May 29, 2017 for Visayas and Mindanao to make your day a whole lot sweeter and chocolatier! The Choco Mallow Pie will be available for dine-in, take-out, delivery, and drive-thru in all Jollibee stores nationwide, for only P32.00* (solo) and P89.00* (pack of 3 Pies-to-Go).